Whether you're into juicing veggies or making slow-cooker bean stews or are into the #eatclean movement, we've gathered together a super batch of tech for a healthier you. Whip up ice-cool, all-natural desserts in a matter of seconds with the Dessert Bullet. Just toss your frozen ingredients into the 'chute' (follow one of the many recipes from the included booklet), push down on the 'fruit plunger' and voila! Enjoy a bowl of ice-cream-esque loveliness. There are over 90 desserts to make, and each comes in at under 200 calories, so you can tuck in without feeling guilty. This Bluetooth-enabled gadget cooks food to perfection by bringing it to a specific temperature for a set period of time. Simply pop your fish, meat or vegetables into a ziplock bag, place it in a pot of water, clamp the Cooker to the side of the pot and control the sous vide fun via the Anova Culinary app. Designed to work with your iPad (all models), this funky kitchen scale, covered in heat-resistant silicone, connects wirelessly to the app, enabling you to create delicious, wholesome meals and treats. The scale weighs in ounces or grams, and a touch-button front enables you to interact with the fully loaded recipes app without getting your mucky fingers on your iPad. Equipped with a powerful motor and stainless-steel blades to blitz through ingredients, this pro blender has a pulse feature (for chopping) and eight speeds (think low speed for chunky salsas, high for purees). It also comes with two containers, including a portable 0.6-litre number so that you can guzzle your smoothies on the go. 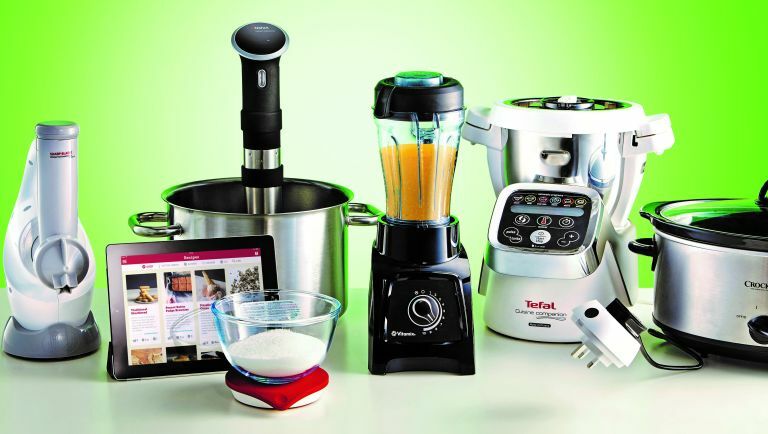 Featuring six automatic functions, 12 speeds and a manual mode, the Cuisine Companion can make nutrientdense soups and sauces, steamed veggies and fish, slow-cooked meats and healthy desserts – simply put your ingredients into the bowl, select the relevant function from the touchpad display and away you go. The 2.5-litre bowl is also perfect for handling big- batch cooking, enabling you to freeze portions and stock up for busier times. The Cuisine Companion's manual mode means you can control the speed, temperature and timings of any dish you create from scratch. But, honestly, why bother when this gadget can cook everything from stew to sorbet with minimal interaction from you? Can't wait for the Crock-Pot Smart Slow Cooker With WeMo to hit the UK? Then nab a standard Crock-Pot and pair it with a WeMo Insight Switch instead. Wi-Fi-enabled, this device helps you control electrical appliances in your home. Fix it to a socket in your kitchen, plug in your Crock-Pot and control the cooker via the WeMo app on your phone. Staying hydrated is a must for transporting oxygen and nutrients to your cells and brain, for metabolising stored body fat and helping you stay alert. HydraCoach (£22) ensures that a) you know how much water you should be consuming daily, based on your weight and height, and b) you actually drink it. The bottle's display shows the total amount of fluid you drink each day, and gives you readouts to help you achieve your personal hydration goal.